Today we will learn very formal and polite Japanese expressions. = Osoreirimasu ga, okawari wo itadakemasuka? You say 「恐れ入りますが…」 ( = Osore irimasu ga) before you ask someone a favor or a question. = Osore irimasu ga gomi wa kochirani osute kudasai . = I am truly sorry to bother you but please throw away the trash here. 捨てる = suteru = throw away. = Osore irimasu ga, eki made no iki kata wo ooshie itadakemasu de shouka? = Excuse me / I am awfully sorry to bother you, but could you tell me how to get to the station please? = Osore irimasu ga, sokono shio wo totte itadakemasuka ? = Excuse me / I am sorry to bother you, but could you pass me the salt (which is near you) please? （~して）頂けますか？= itadakemasuka = Could you do something for me? = Osore irimasu ga onamae wo itadakemasuka? = I am sorry, but may I have your name, please? 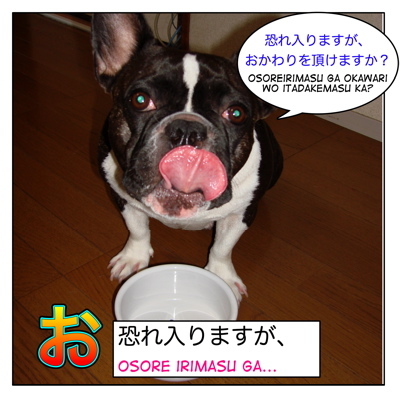 You say「恐れ入ります。」( = osore irimasu) after someone does something for you, too. You also say 恐縮する ( = kyoushuku suru) which means “to feel very grateful” and it is a very humble expression. On-reading is “きょう ” ( = kyou) . So literally you tremble and feel like shrinking for the gratitude or feeling bad for making someone do something for you. = Kyoushuku desuga, kopii wo itadakemasu ka? = Sorry to trouble you, but may I have a copy, please? The sound you make when you gorge yourself. = See, I am trying to be polite to everybody all the time. So please learn from my attitude! I am super enjoying your lesson maggie sensei! I have been to many japanese learning sites, so far you’re on my TOP 3 best japanese learning sites!! btw How do we say “sorry for troubling you but….” but in casual way(talking with friends)? I am VERY happy to hear you are enjoying my lessons. “sorry for troubling you but….” in casual way, huh? Hi Maggie Sensei, when we see the kanji ‘恐’ how do we know we should read it as ‘oso’ from ‘恐れる’ in kun reading or we should read it as ‘kyuo’ from ‘恐縮ですが’ in on reading? On reading is usually used when it is used with other kanji as a compoun word. And kun reading is used on its own with hiragana. i want learn and be able to speak more keigo and formal japanese.. I will try to make both formal and casual Japanese for everyone!